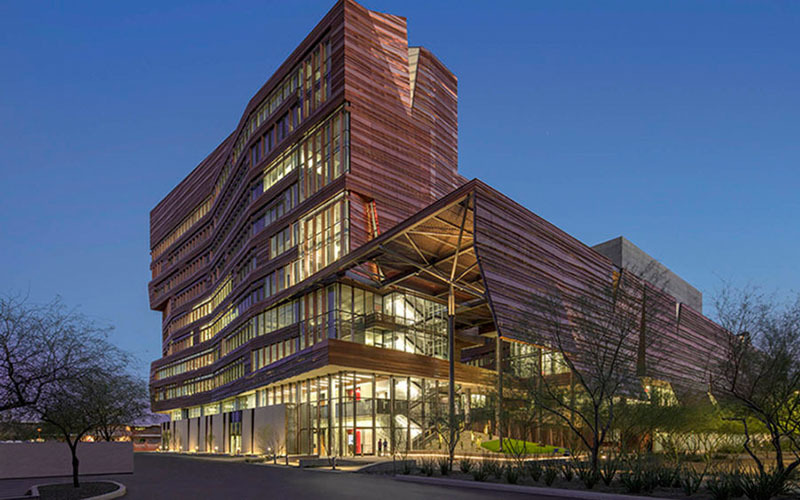 MWG’s efforts on the new University of Arizona Biomedical Sciences Partnership Building (BSPB) have been recognized with a 2018 Excellence in Structural Engineering Award from the Structural Engineering Association of Arizona (SEAoA). The project was honored with the highest level – an Excellence award – for creative achievement and innovation in structural engineering. The BSPB was a joint effort completed with affiliate office John A. Martin & Associates, Inc. in Los Angeles, and serves as an important example of MWG’s capabilities. Standing 10-stories tall plus a basement built around an existing active vivarium, the 245,000 square foot facility was designed and constructed in an astonishing 30-month schedule, which required forward-thinking approaches for future research flexibility, phased excavation and implementation of subterranean structural components, and new ways of quickly and effectively realizing this unique project’s architectural aesthetic.